Set the right tone for your business meetings. Arrive comfortable and relaxed. Give your clients the gift of luxurious travel. Our service is the perfect choice for any corporate need. We understand success. Let our professional, discreet drivers provide you with first-class service. 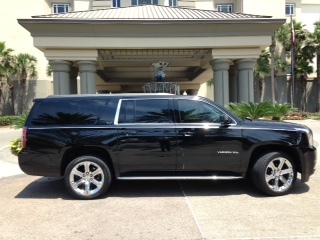 Our large fleet and unparalleled level of service make Montego Limousine the perfect choice for convention travel. We can accommodate large groups and can provide as many vehicles as necessary. Avoid the hassle of traveling to and from the airport. Parking difficulties, wild cab rides, and traffic congestion are some of the reasons why traveling in comfort makes so much sense. Forget the traffic! Let our driver bring you right to the front door. Relax and enjoy the comfortable amenities of our service. Limousines are great for romantic evenings, proposing marriage, and anniversaries. Celebrate a special birthday or reunion of friends with one of our stylish limousines. Our comfortable vehicles and professional drivers are the perfect choice for a memorable evening. Whatever the occasion, let Montego Limousine enhance your experience. If you have a need to go to the Mayo clinic, hospital, or Doctor’s office in the Jacksonville Metro Area, will be happy to accommodate your request. We are driven to the ultimate client satisfaction.